Since this is my first real post, I feel the need preface it saying that this is WAY more complicated than my normal Monday-night-meal. There were 3 different pots/pans used. That is a lot, normally, I'm low dish. 1 is ideal, 2 is pushing it, 3 is almost unheard of. Ok, I'm done - to the dinner. I had some fresh basil to use that a coworker gave me (I'm working on growing my own, more on that later), that was the impetus for this plan. So I planned to make a new sauce a creamy butter sauce. It was a failure. It was supposed to be this but I was gonna use basil, cuz I had it, instead of sage. The sauce would not thicken. I almost called tech support (mom) but instead I added some flour, more flour and finally it was edible but not fabulous by any stretch. But the next time I make alfredo sauce, I might use some chicken broth to make it a little lighter. Food for thought. 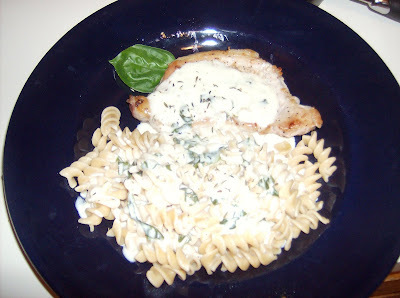 I also made some pasta and pork chops. They were both great. Pork chops were on sale (boneless, center-cut 3.99/lb), so I got some, sounded good. It occured to me, in the middle of cooking naturally, that I was making pork and a chicken broth sauce...mmmm...bit odd but that wans't bad really. Maybe it will be better when I have serving two for lunch tomorrow. Too bad I had to start off the new blog with a failure (or at least not a sucess), I should have made the butternut squash that will be for tomorrow - if I'm feeling motivated.